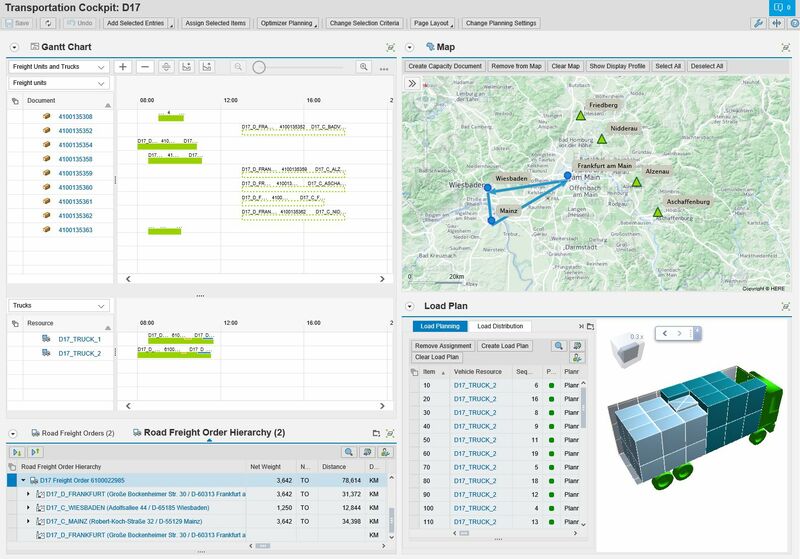 Since SAP Transportation Management 8.0 the application is delivered using SAP Visual Business as it’s geo-map component (see MKS06). Long history, a lot of compromisses, but now picking up speed rapidly. With TM 9.4 the use cases are supported with new features and we see high interest. Today I would like to explain the new feature to configure the geo-map applications almost completely using layouts. After each step we waited for customer feedback, improved the solution following this guidance and decided if we want to continue the road map. Especially step 4 was not completely clear to me if we can come up with a standard solution for this. SAP internal changes, other TM priorities and stuff came inbetween and stretched our plan, but with TM 9.4 I think we finally come close to my vision. 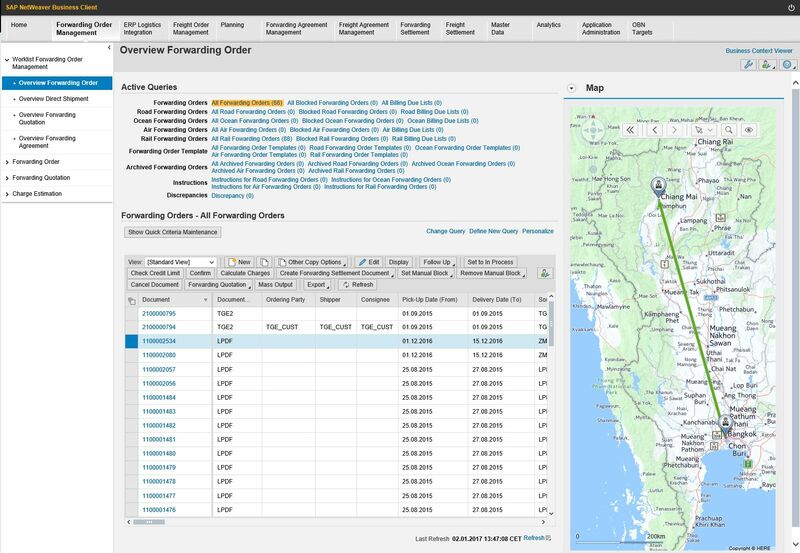 Basically there are 3 geo-map use cases in SAP TM supported today. Map Display Component (MDC): A almost display only component showing stage like objects like Forwarding Orders, Freight Orders, Bookings. Available in the documents and the worklist. Only limited features, no object adjustments or planning possible on the map. Adding a different view on the objects next to the forms and tables to check the geographical attributes. 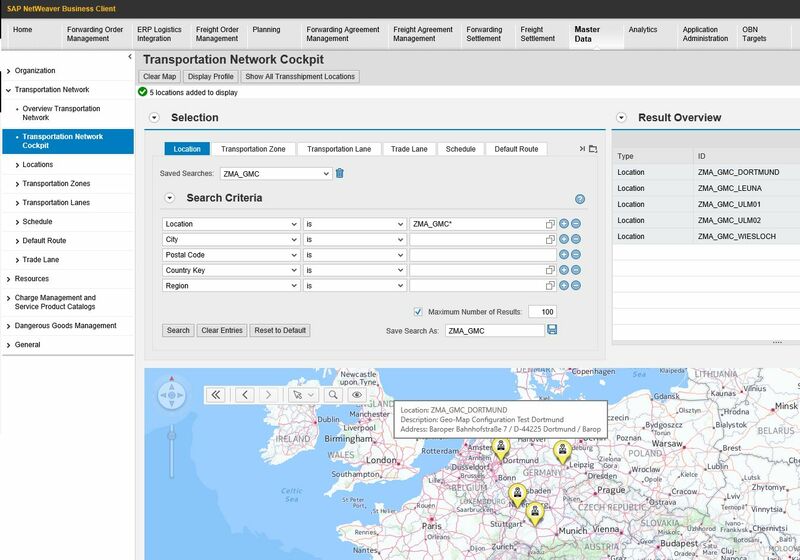 Transportation Network Cockpit (TNC): Showing transportation network master data (locations, lanes, schedules, trade lanes, …), allowing to browse through the network using find functions. Some network adjustments possible like changing object coordinates and on-map object creation. Basically a tool for network administrators. Visual Transportation Cockpit (VTC): The ‘planning’ map in the Transportation Cockpit showing selected documents and resources. Enabled to plan using context menu or drag&drop. Before TM 9.4 all objects shown on the map where defined by SAP regarding colors, icons, and so on. There was an enhancement spot available to adjust almost everything and I know some partners having done projects in that area successfully. This was sufficient for our first road map items, but to reach step 4 it became clear that we need a strong flexibility how objects look like and behave. Attached Functions: Which functions are available in the map and object context menu? Object Behaviour: How do objects behave when added to the map (highlighted, zoomed, and so on)? How objects behave when using drag&drop? 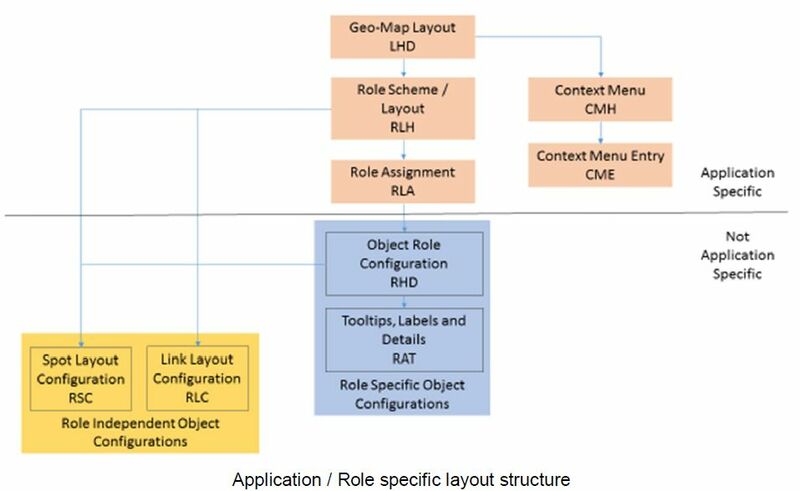 The geo-map layouts are defined as customizing under Basic Functions -> Geographical Map -> Define Layouts for Geographical Map. The application comes with delivered layouts for each use case. I honestly have to admit that it in the beginning looks and maybe is a bit complicated. Reason for this is that we wanted to really enable the configuration of every aspect while still making it possible to re-use every definition in each of the layouts. Basically on the lowest level you define spot and link configurations which you can re-use. Then per TM specific object (defined by a role, for example a location or schedule stage) you assign such a configuration and make object specific settings. For example here you define how a standard location should look like (in the worklist, network cockpit, and transportation cockpit). For each of your layouts used for the different use cases, you then define the supported objects. Next to that, you can define the object context menu. Using this separated structure, you can either have exactly one definition per area re-using everything in all application, or specific definitions supporting a large variety of deviating usages (for example you want the location to look alike for all users, but to offer completely different functions). We believe that the delivered layouts can be used as a good starting point when adjustments are required. Last step required is to tell the system which geo-map layout shall be used. For the MDC (documents, worklist) and TNC this can be done by setting the default indicator in the geo-map layout definition. So you do not have the option to make this user / role specific. As those are the display only use cases, it should do the job for now. If you have detailed requirements, let us know. For the MDC and VTC used in the cockpit, the geo-map layout can be defined in the page layout (MKS67). When adding the map component and going to the details, a dedicated field for the layout is available. Not enough time today to go into the details, another MKS will follow. Then I will show the map based planning scenarios enabled and supported by the configuration. I have a question specific to SAP TM 9.4 map access, still users have to install VB on local systems to access map TNC and TC etc…? No, TM 9.4 uses the UI5 Visual Business control. No client installation required. Marcus, Thanks for the quick response. I have the same question for EM 9.2 WebUI. Do we still need to install this front-end plug-in? Does the 9.4 system map display work on Mac?